Vincent Torres is the owner of Bullseye Sport in Riverside. Torres came to the United States from Cuba at seven years old. He's been in the firearms industry since 1977. Vicki Ferrall of Riverside, a frequent customer, buys ammunition at Bullseye Sport on Wednesday, Feb. 22, 2017. Ferrall is a certified pistol instructor and is part of the local chapter in the National Rifle Association. Vincent Torres, owner of Bullseye Sport in Riverside, says sale in 2016 were "out of the ordinary." More than a million guns were sold in California last year. Vincent Torres owns Bullseye Sport in Riverside. Torres first started the business in 1995 from his home doing only gun shows. In 2008, he opened a storefront. 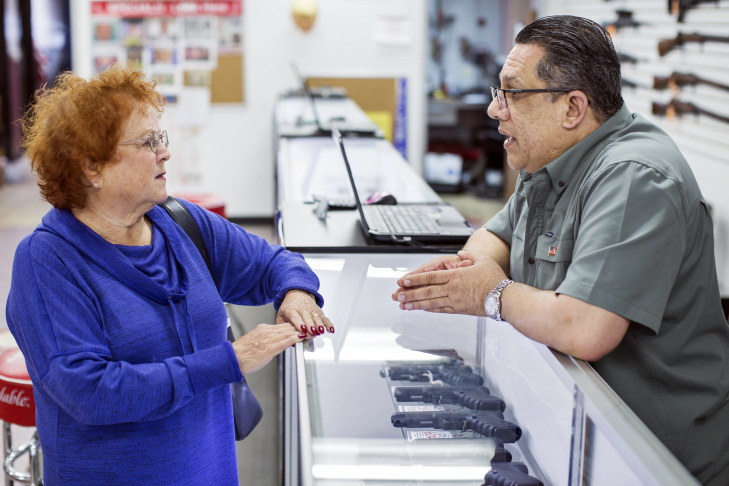 Frequent customer Vicki Ferrall, left, chats with owner Vincent Torres at Bullseye Sport in Riverside on Wednesday, Feb. 22, 2017. Torres first opened his storefront in 2008. After six months, the business outgrew their space and moved into this 10,000 square-foot space. Vincent Torres, owner of Bullseye Sport in Riverside, says every presidential election year is a strong years for his business. That's according to data from the California Department of Justice's Dealer Record of Sale system, which tracks gun sales in the state. Data the agency provided to KPCC shows that sales accelerated as the year went on. Experts and gun owners point to politics and anxiety about gun control measures as the driving forces behind 2016's gun-buying frenzy. A look at gun sales in California from 1991 through 2016. Sales initially spiked in the summer, after a mass shooting at an Orlando nightclub left 49 dead, and as President Obama called for gun control measures. Then in June, the state legislature passed a series of gun control measures, including two bills that closed the "bullet button loophole." Those measures expanded the definition of assault weapons, leading gun buyers to snap up the items before they went off the market. Sales heated up as the year went on. Gun control became an issue in a presidential election many expected Hillary Clinton to win. And in November, Californians approved a proposition to perform background checks on ammunition purchases. The holiday season didn't hurt either. The single biggest day for California gun sales was Black Friday, when residents purchased more than 13,800 firearms in 24 hours — about 10 guns sold every minute. Some cities sell guns at far higher rates than others. Many of the state's big, liberal enclaves, including Los Angeles and Long Beach, have low per capita sales. San Francisco, where the last gun store closed in 2015, recorded zero sales for all of 2016, according to the Department of Justice's data. 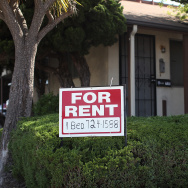 Other areas of the state are hotspots, including large swaths of Southern California. In Orange, Riverside, San Bernardino and Ventura Counties, per capita sales outpaced the state figure. 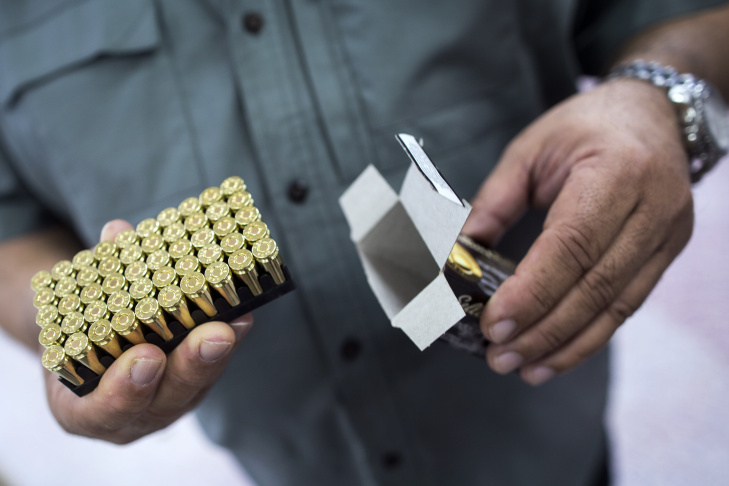 In the city of Riverside, 63 guns were sold per 1,000 residents — double the state rate. 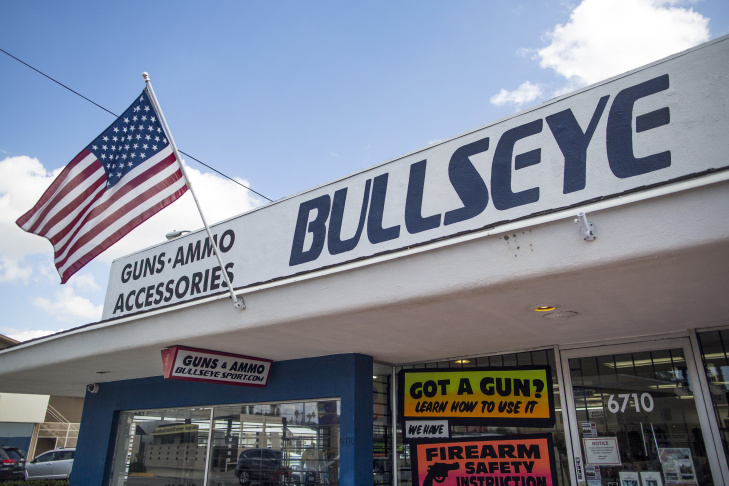 The city has been home to Bullseye Sport gun shop since 2008. On a recent weekday morning, sun streamed in through the windows as the store filled up with shoppers. Vicki and Tim Ferrall were among the people browsing the ammunition aisle. The couple are both members of a local NRA group. "I like to shoot everything, whether they're pistols or rifles," Vicki Ferrall said. "I'm a hunter. So I like them all." 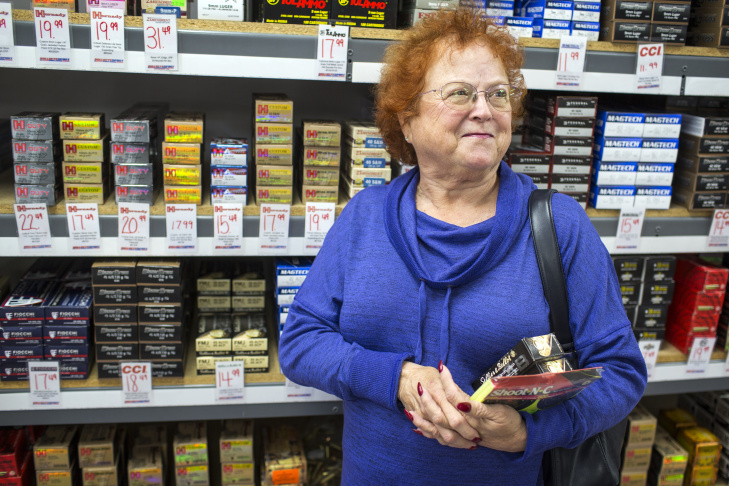 Ferrall, who has lived in Riverside for 50 years, was in the store buying ammunition and targets for a gun safety class she teaches for women. 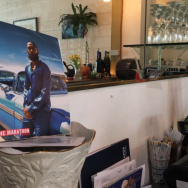 A few feet away, owner Vince Torres leaned on the counter. Rifles and shotguns are mounted to the wall behind him, including some from his own collection, and pistols lie the glass display case below. Torres has run Bullseye Sport since it opened, and before that worked the gun show circuit until the travel caught up to him. 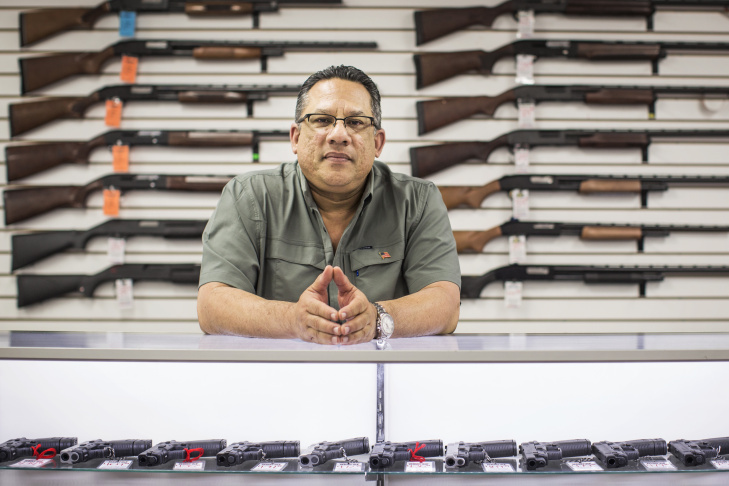 Torres came to the U.S. from Cuba as a child, and found his first gig in a gun store translating for Spanish-speaking customers in the 1970s. Torres said that in all his time in the industry, he's never seen a year like 2016. "It was hectic, it was crazy. We got merchandise going in one door and literally going out the other door," Torres said. The types of rifles that legislators voted to restrict in June were especially fast sellers. "People were just buying those guns like they were going out of style, which they were," Torres said. "So it was just a perfect storm for our industry in California." These days, you can’t walk through the store without seeing Donald Trump, either on the television glued to Fox News or on the memes printed out from the internet and taped to the walls. Many gun owners breathed a sigh of relief when Trump took office in January, and hope his administration will expand gun rights. But deep blue California may well move in the other direction, further tightening regulations around guns. If that happens, Torres expects sales will remain high. 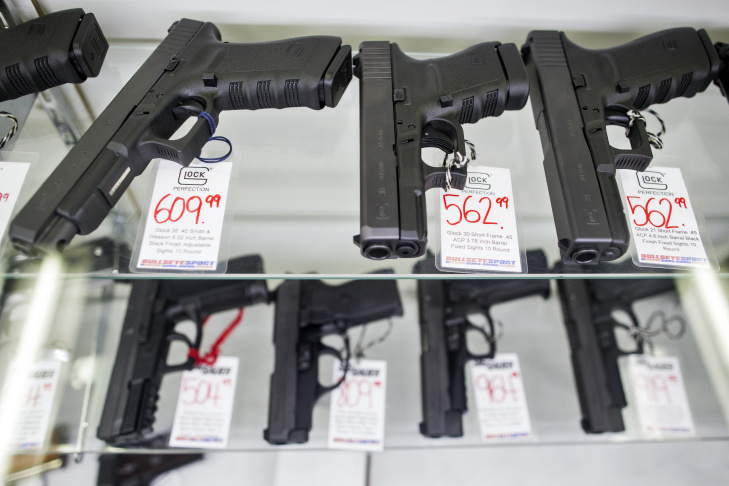 Rhetoric about gun control means good business for the stores who sell firearms. "President Obama was one of the best marketers for the firearms industry that anyone could ask for," said Craig DeLuz, a lobbyist for the gun rights group Firearms Policy Coalition. 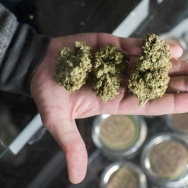 "The California legislature is probably number two on the list." Gun control advocate Ari Freilich takes the other side on most issues. An attorney at the Law Center to Prevent Gun Violence, Freilich views last year's spike skeptically. "The corporate firearm industry and its lobbyists, they make a lot of profit by convincing a small but devoted customer base that they should be anxious and agitated," he said. Think of it as the "the gun control paradox". That term comes from UCLA Law professor Adam Winkler, who points to the way gun control sparks gun sales. But the people rushing to to the stores often already own a gun — or several. "Increasingly, you'll find fewer and fewer gun owners owning more and more guns," Winkler said. 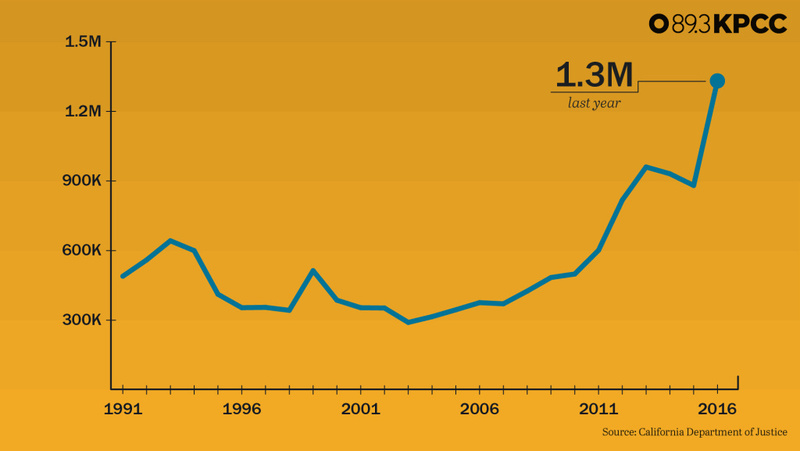 Surveys show the share of households with firearms has been declining for years. That appears to be the case in California, where sales far outpaced the number of new firearms safety certificates issued. 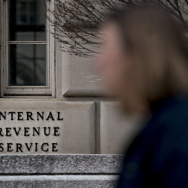 Through December 15, just over 386,000 certificates had been issued by the state Department of Justice, according to figures provided to KPCC. The certificates are required for most new gun buyers. During that same period, about 1.2 million firearms were sold. For many Californians, bearing arms isn't just a consumer choice or political position, it's a way of life. "They are shooters, in the same way that someone might be a golfer or a bridge player," Winkler said. "That's partly why so many people are out there shooting on the weekends and why gun sales continue to rise." That lifestyle is on full display at places like Vince Torres' Bullseye Sport. "Vince is a great Second Amendment supporter, and we like to go to those stores that support our beliefs," said Vicki Ferrall, who has been a customer at the store since it opened. Ferrall, who teaches the 'Refuse To Be A Victim' courses for women, sums up the area's gun culture by paraphrasing Senator Phil Gramm. "I have more guns than I need but not as many as I want," Ferrall says, chuckling. "And that's been my motto for a lot of years."